Sharon Clarke has been entertaining audiences of all ages with stories and songs for 25 years. She worked as a Preschool Teacher and in Children’s Programming for the Public Library System before venturing out into storytelling and music full time. 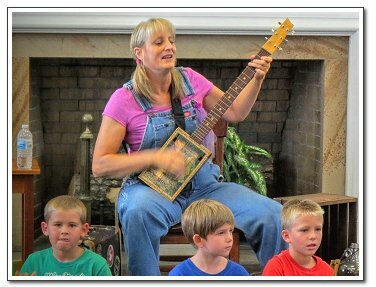 She has performed in such settings as: the Historic Morganton Festival, the Waldensian Festival, Vance County’s Storytelling Festival, as well as at Workshops, Schools, Churches, Preschools and Libraries all over the Southeast. Sharon weaves together song with story, imagery with imagination to delight and captivate the listener. Her dramatic and unique style keeps her audience entranced…laughing and crying…As they quickly and unknowingly become part of the yarn spinner’s web. Sharon uses her high school and college background in music and the performing arts to create a dynamic and inspiring storytelling experience. Sharon Clarke resides in Connelly Springs, North Carolina on a small farm. She is blessed with four wonderful children and three delightful grandchildren now. Sharon has performed at festivals, libraries, schools, colleges and more…. Taught workshops, classes and seminars…..